I thought that with George Clooney getting his Parthenons and Pantheons mixed up it would be fun to debate the Parthenon Marbles this month. It seems to me that the Brits, when it comes to our own country and culture, are all very protective in one way or another. When it comes to the culture of another country some are also very possessive. George Clooney recently reignited the debate about the Parthenon Marbles (or Pantheon Marbles as he accidentally called them) in a press conference in February for the launch of his new movie The Monuments Men. No matter how much the British Museum would like to sweep this issue under the carpet once and for good it is sure to keep rearing its ugly head as long as it is kept in the media. There are a hundred ways in which this could be debated and both sides have their supporters. Where do you stand? Read the following articles and form your own opinion. This is George Clooney's reaction to (Lord Mayor of London) Boris Johnson's comments and gives you some idea of the reasons why the marbles should be returned to Greece. 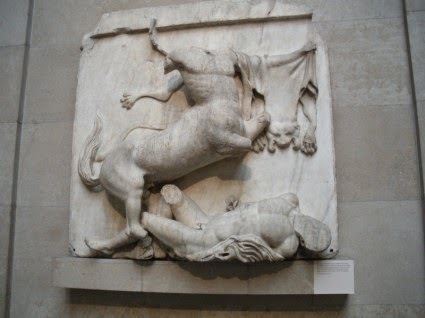 This article was published when the Parthenon museum opened and shows the British Museum's reasons for keeping them in Britain. Click here for a worksheet that goes with both articles. There will soon be a short summary of points to argue in the new 'Cause for Debate' section, as well as a super Museum Visit role play for levels B1 - C2!